Bob Reynolds doesn't recognize the body in the creek, but he does recognize the danger of it. He's a newcomer to town, not entirely welcome, and not entirely on good footing with the sheriff. So far he's kept his head down, mostly over the bar at the Crow's Nest. But he has interests other than drinking and spending his inheritance, including one that goes by the name Tammy Fay Smith and who may have caught the sheriff's eye as well. Reynolds would rather pretend he never saw the body, but when it disappears, he begins to doubt what little he knew about this secretive town, a town that seems to become more unwelcoming by the day. Try as he might, he just can't forget the body, despite the advice he's been given to do so, and despite the evidence to suggest that he might be disappearing himself soon enough. 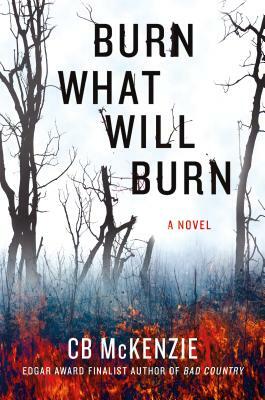 Following his acclaimed, award-winning debut, Burn What Will Burn confirms CB McKenzie as a one-of-a-kind crime novelist with an unforgettably original voice. CB MCKENZIE is the author of Bad Country, which won the Tony Hillerman Prize and the Spur Award from the Western Writers of America and was named a finalist for the Edgar and Shamus Awards for Best First Novel. A graduate of Arkansas Tech University, he lives on the Slow Coast of California when he's not traveling.